You may be planning to close your business, which means that you have a lot to think about before you can finally call it quits! Don’t forget to the put the IRS on your to-do list, as tax laws dictate that you need to keep the tax agency informed of your decision. Make sure you know what you do when you close your business, as any missteps could lead to the need for an IRS tax lawyer! Your business may have just been a new project that fell through, or maybe you’ve been running it for the past 50 years—regardless, at some point, you may need to call it quits for whatever reason. 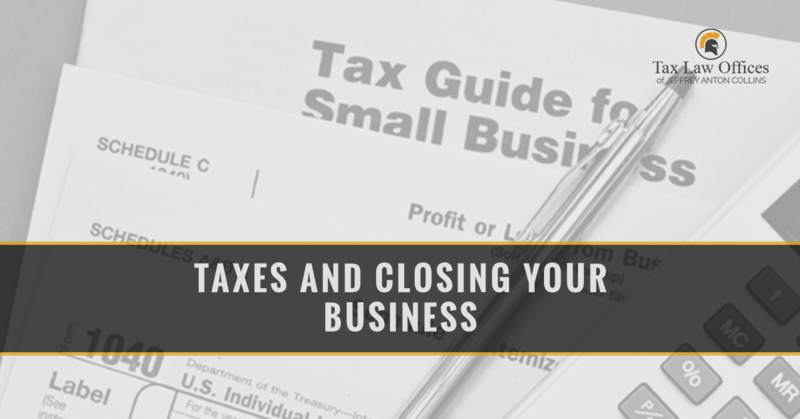 If you are thinking about closing your business for good, it’s important to let the IRS know what your plans are. You will undoubtedly have a few loose ends to tie up when it comes to your taxes, but that will depend on how you have been running your business. Have you been working alone? Do you have employees? Read on to learn more about what you will need to do in certain scenarios. If you’ve been doing things on your own with no employees, you’re in luck. Reporting your shutdown to the IRS is a simple process! Let’s pretend you’ve been a self-employed consultant for a few years, and you have filed a Schedule C every year in order to report both your expenses and your income. You have been working by yourself at your own home, and all you’ve been using for business is the family’s computer and the home telephone line. Maybe you get a job offer from one of your clients that you simply cannot pass up, so you decide to stop running your business. If you just close your business by stopping all operations, there is nothing special you will need to do for your income tax return. However, if you sell your business for someone else to run, you will need to go through the disposition process and include that transaction in your income tax return. If you have been running a business with assets, things can get slightly more complex. You will still need to file that final Schedule C form, and you’ll also need to give the IRS any details about your asset sales. Let’s use another example situation. Maybe you’ve been running a business by yourself and crafting jewelry, as well as selling it, in a retail space. After a few years, you decide to move onto some other business venture. Even if you get rid of your business by selling it to one person, the IRS will need you to separately determine the value for all of your assets. This includes everything from your welder to your furniture and store lease. They need to ensure that all of these are treated properly for tax purposes. When you determine your assets’ market value, you can figure out whether there is a taxable gain or loss. You list the assets, write down the value and sale price of each on Form 8594: Asset Acquisition Statement under Section 1060, then attach it to the 1040 you file for the year your asset sales happened. Unfortunately, there is even more to do if you have been running a business with employees, as you will need to wrap up all your payroll responsibilities. If you’ve been running a small retail shop, maybe you’ve had a cashier and a salesperson who both worked full time. That means you have had to withhold income and employment taxes from their salaries, as well as paying your employer portion of their employment tax. Since your payroll tax deposits have probably gone over $1,000 each year, you’ve been making deposits and filing Form 941 every quarter. If you close down, that means you’ll need to issue final W-2 forms to your employees before the due date of your final tax return. You’ll also need to final a final Form 941 for the final quarter where you paid your workers. You can also use that form to inform the IRS that you are shutting down. Check the box on Line 18 and enter in the date you last paid your employees their wages. Keep in mind that if your employment tax deposits were $1,000 or less each year while your business was running, you qualified to file and make deposits just once per year by using Form 944. If this is the case, when you close your business, you can file a final Form 944 for the last year that you paid your employees. Regardless of the size of your payroll, any employer going out of business is required to attach a statement to the final employment tax return that shows the name of the person who is holding onto the payroll records of the closed business, as well as the address where those records are being kept. If you had some sort of pension plan for your employees and yourself, you will have a few extra responsibilities surrounding that. Simplified Employee Pension (SEP): This plan can be shut down at any time. You just need to let the participants know, as well as the financial institution that has been managing the plan. Savings Incentive Match Plan (SIMPLE): This is a little more difficult to shut down since it is operated on a calendar-year basis. You will not be able to terminate this plan until the end of the year, so you will need to continue funding it as promised for the rest of the year before you can terminate it. If you are in need of a tax lawyer, it’s time to call Tax Law Offices. We have the experience and knowledge you need to get the best possible outcome in your case. When it comes to dealing with the IRS, we know just what to do. Don’t leave anything to chance; contact us today for a free consultation.